Today we had a bit of fun at work. 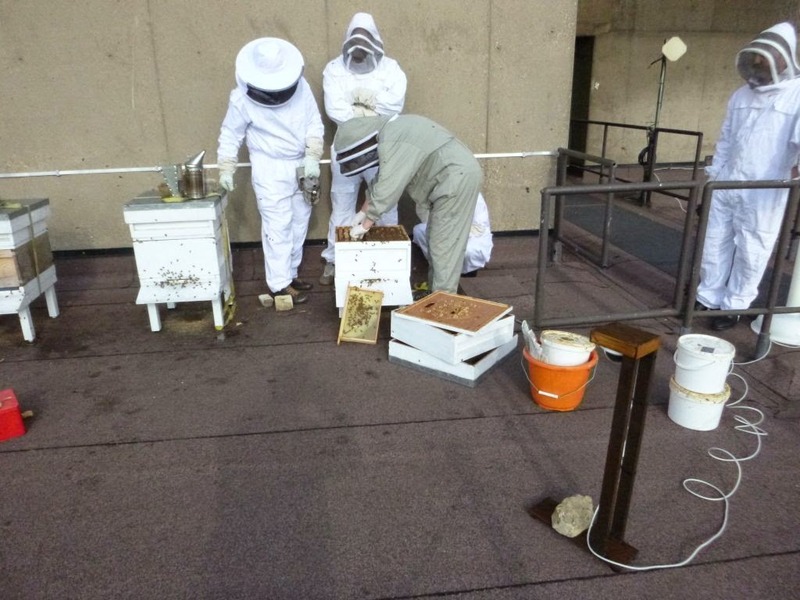 The University has some beehives and we got asked to sort out a webcam that overlooked them. Given the lack of money for this project, as per usual, we were limited to buying consumer quality kit for this. We've ended up with a TrendNet IP66 rated PoE dome camera which actually works quite nicely. However like most of these things it's designed to fix to wall or a ceiling. Which doesn't really work given the location of the hives. So last night I knocked up the little stand you can see in the bottom right of the picture and stuck a couple of coats of wood preserver on it. It's not perfect but is solid. The brick is a design feature. When we went up on the roof to put it in place, they were checking the hives so I actually got a couple of decent pictures where you can see the inside of the hive. Once it's actually accessible from the Internet, which is my next job, I'll post a link.